Confusion And High Costs Still Hamper Obamacare Enrollment : Shots - Health News Will the third year be the charm for coaxing the uninsured to sign up for health coverage? Federal officials are targeting Newark, N.J., and four other cities during open enrollment. 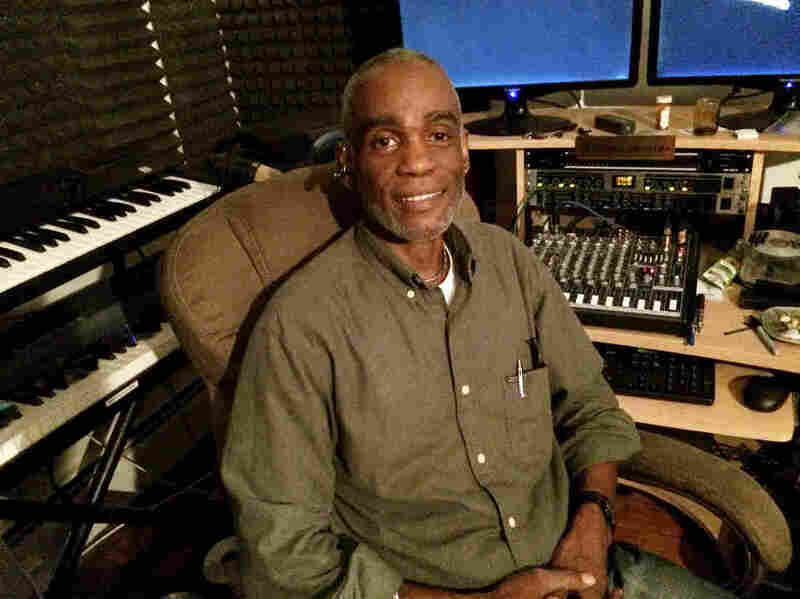 Vernon Thomas, a part-time music producer, is trying to decide whether it's worth it to sign up for health insurance. Recording and mixing music are Vernon Thomas' passions, but being CEO and producer of Mantree Records isn't his day job. He's an HIV outreach worker for a county health department outside Newark, N.J. He took what was to be a full-time job in May because the gig came with health insurance — and he has HIV himself. But then the county made it a part-time job, and Thomas lost health coverage before it even started. "Benefits are more important than the money you're making," he says. The Affordable Care Act's third open enrollment season started Nov. 1, and federal officials are hoping to reach about a million uninsured people nationwide before it closes on Jan. 31. Newark has an estimated 112,000 uninsured people, including Thomas, around one-third of the city's population. Newark is one of five areas – along with Houston, Dallas, Chicago and Miami – where the federal government is focusing enrollment efforts. Altogether, Washington will spend more than $100 million dollars on marketing and enrollment nationwide. Why has Thomas stayed on the sidelines for Obamacare's first two years? He values insurance and regular health care, but he says he didn't fully understand what the law had to offer him. He's still trying to make up his mind about signing up for coverage this time around. He has been getting HIV medications, care of the federal government's AIDS Drug Assistance Program. It doesn't cover anything else, though, and Thomas says he'd like more medical care, particularly a regular doctor who could keep an eye on issues that worry him. "Prostate cancer runs in my family on both sides," Thomas says. "My mother and her mother and her brother all had diabetes. My mother had hypertension also. Fortunately, I have low blood pressure. But now they're saying I have high cholesterol." Thomas' part-time job doesn't pay a lot, yet he makes too much to get free health care from Medicaid. He's eligible to buy a plan on the exchange, but he says it's too expensive because the cost of living in Newark is high for him. So he has gone without coverage and kept his fingers crossed. "I try not to think about it — getting sick," he says. Thomas didn't know the health law's benefits for people in his income bracket. He qualifies for subsidies that would bring his premium down to $100 or less and also cost-sharing support that would pick up much of the deductible and other out-of-pocket expenses. Brian McGovern, head of the North Jersey Community Research Initiative, says overcoming misconceptions about Obamacare has been one of his staff's biggest jobs. "It's always been about trust with some of our patients," he says. Susan Nash, a partner at the McDermott Will & Emery law firm in Chicago, says that health insurance is still too expensive for millions of people living paycheck-to-paycheck. "These individuals are having difficulty affording food and housing, and so it's a calculus: 'Do I need health insurance? Do I think I'm going to have a catastrophic event or have some large health care expenditures this year?' " Nash says. The government says about 8 in 10 of these eligible but uninsured people qualify for subsidies. But some of them will get only a little help from the government — and others will get none at all. Middle-income people can spend hundreds of dollars a month on a high deductible, if they need significant care. And they wouldn't qualify for the same help with out-of-pocket expenses that Vernon Thomas would. That means they often spend additional hundreds of dollars before coverage actually kicks in. Still, under the law, most people have to get insurance – or face a tax penalty next year of either 2.5 percent of income or $695 per adult and $347.50 per child under 18, with a maximum of $2,085. Even if people have a sense of these fines, they still might not worry about it. The fines don't actually hit until Tax Day, 2017. And for many of people, that's just too far away – and just too abstract. This story is part of a reporting partnership that includes WNYC, NPR and Kaiser Health News.